Portable radiation detectors for use in the field: we have a huge range of rugged, portable gamma radioisotope detectors and neutron detectors, operating at room temperature, sensitive with low power requirements. We make a range of portable radiation detectors that are specifically made for use in the field, some are handheld while others are small enough to be carried in a vehicle. It is often safer, cheaper and more cost effective to conduct analysis in-situ than to carry material back to a laboratory and of course in some circumstances it is impossible to move an item, for example checking scrap metal for radioactivity. Outside of the lab, you need detectors that can withstand being carried around, have low power requirements, require minimum maintenance, can operate at room temperatures and offer you the sensitivity you need. Our range includes handheld detectors and larger vehicle portable shielded radiation detectors, that can act as a portable radiation lab. Some of these radiation detectors are battery powered, the others can be USB powered from a laptop or from a vehicle power supply. Detectors either use their own in-built gamma spectroscopy software (D3S ID and Raymon10) or use a laptop running KSpect or MultiSpect gamma spectroscopy software. The RayMon10 (which has an option for quantitative analysis) is our premier rugged radiation detector and is designed to be used by professionals that need the best in one device. It is one of our most popular products and has proven itself in action time and time again. It uses a GR1 detector in the probe so you get the radioactive sensitivity you need. 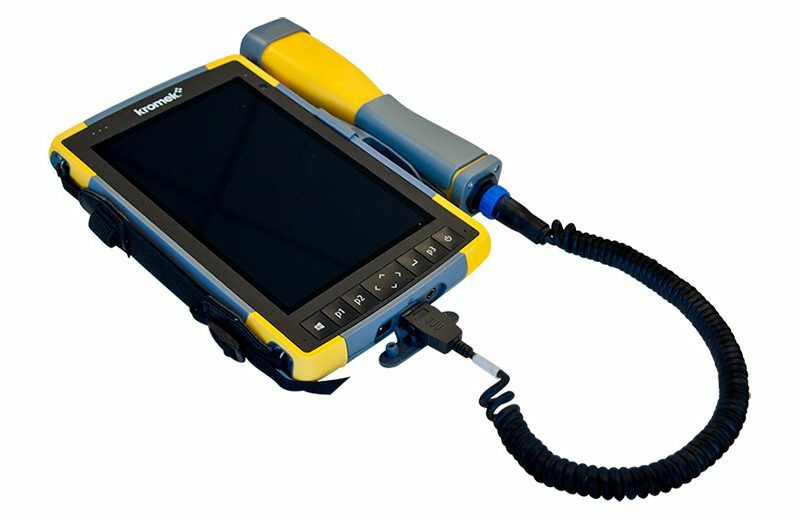 Everything else you need is included with the pistol grip tablet running analysis software. The device can be fitted with a camera and has GPS capability to allow you to send a full report of an incident back to base. It is the perfect all in one device for the radiological professional. Full specifications for the Raymon10 can be found on its dedicated page. 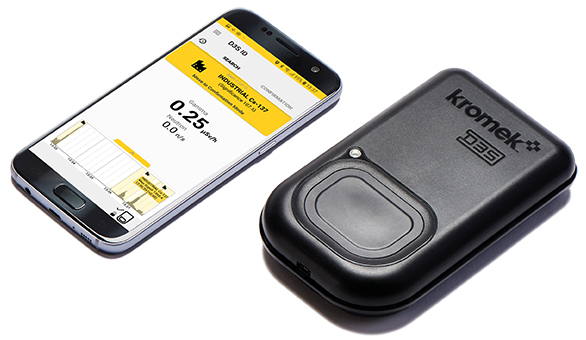 The D3S ID was originally designed for security (CBRNe) applications but at its heart, it is a very easy to use, rugged gamma-ray and neutron detector that is designed to survive being carried around and lasts a full work day on one charge. It offers easy to understand isotope identification (dose and isotope fingerprinting) as well as neutron detection – which means it can uncover even shielded radiation sources. The user is told via the easy to read phone app screen what radioactive isotope has been found, the phone can even use its voice chip to announce the results. The detector is always scanning making it perfect for use when your attention is on other things and is light enough to be carried all day. Find out more on the D3S page. Originally designed to look for radioactive contamination in food following the Fukushima Daiichi nuclear disaster this is one of our most sensitive radiation detectors designed to identify radioactive contamination in food, liquid, soil and water. This van portable device gives you shielded sensitive gamma-ray detection for quantitative analysis of low activity samples to test for radioactive contamination. 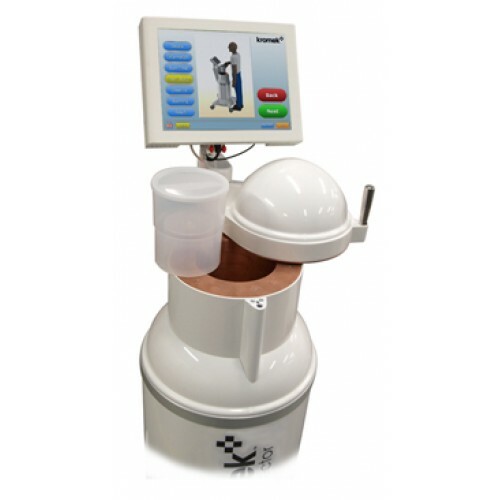 It can measure up to one litre of liquid or solid using a 75 mm x 75 mm NA(Tl) detector operating at room temperature. The Sample Inspector uses the highest room-temperature sensitivity detection systems available today. It has a very easy to understand user interface making it easy to use. The unit itself can be calibrated to the nuclides you are interested in and can be set to show a pass or fail screen as well as measured activity. 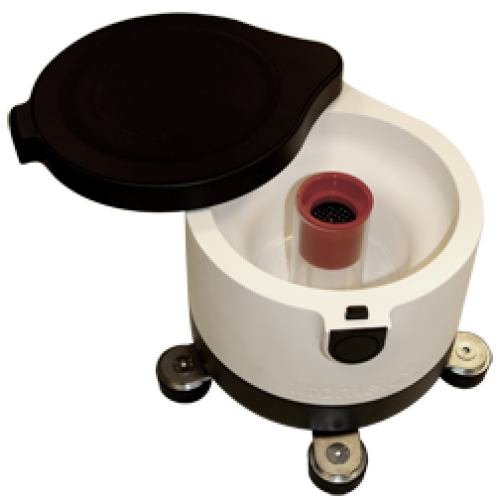 The Quant for GR1 is a gamma detector solution for mobile laboratory radionuclide analysis. Originally built for EDF to fit inside their vans to allow them to make radioactivity measurements in the field. This pressure cooker sized unit is designed for measuring the activity of radionuclides in filters, filter papers, or samples in beakers. It comes with an optimised and integrated lead/copper shield that enables operation in both standard and raised backgrounds. The low power, small form factor, reliability, and no requirement for cooling, enable measurements of various configurations of samples, without the need for time-consuming transport back to an offsite laboratory. The unit can be fitted with any of the GR1 family of CZT-based detectors. It provides less than 2% energy resolution at room temperature, beating any conventional scintillator detector. The Quant allows clear separation of gamma peaks within complex mixed radionuclide samples for accurate quantification of individual radionuclides without the need for chemical separation. Unmanned vehicles are becoming a very popular way to patrol or map an area for radioactive material. Unlike high-altitude flights, a small drone can get close to the area of investigation providing clearer results and costing much less. Unmanned vehicles keep operators out of harm’s way, can be quickly deployed and can speedily map a wide area. 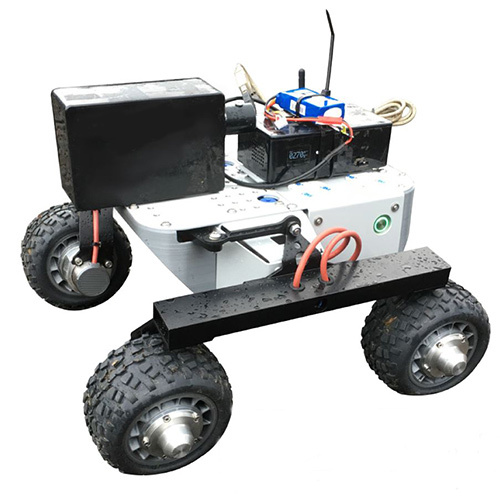 Our detectors can be mounted on a flying drone (UAV) or ground-based rover (UGV). A variety of our detectors are suitable for this, including the D3S, GR1, Sigma scintillation detectors and TN15 thermal neutron detector. We can supply a complete out of the box unmanned radiation mapping drone solution complete with flight training, spectroscopy software, portable radiation detectors and a 3D mapping system. If you do not need a complete drone system, our portable radiation detectors are perfect for your own drone vehicles, see the details here. Our other detectors while not specifically designed to be portable are small and robust enough to be used outside the lab. 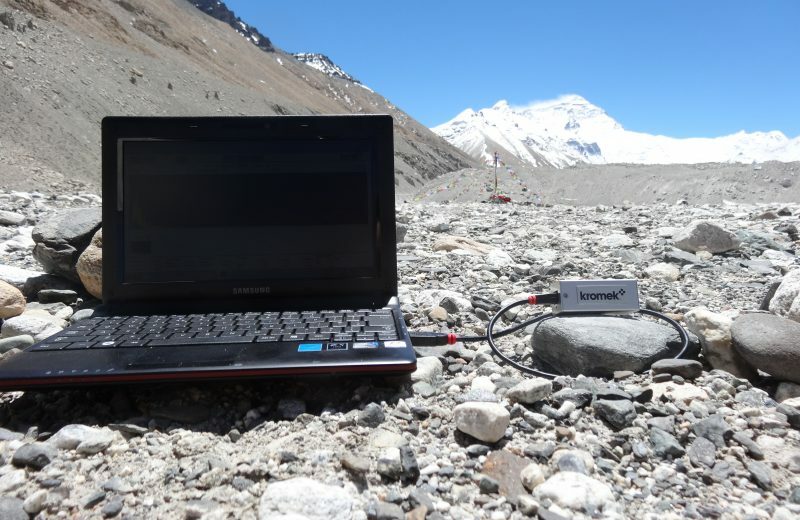 These radiation detectors are small, self-contained and can be powered by a laptop USB cable. You will need a laptop running our gamma spectroscopy software to make use of these radiation detectors. GR1: our extremely popular CZT-based detector is easy to carry (it is about the size of a lipstick or cigarette lighter), is USB powered and self-contained, with built-in preamplifier, shaping amplifier, baseline restorer, pulse height digitizer, and HV supply all built into the unit. It was robust enough to be used at Everest basecamp. SIGMA: our range of scintillator-based radiation detectors. Robust, small and light SIGMA units are perfect for use in the field and in the lab. Clients have flown them on drones, built them into large detector arrays and other devices. TN15 thermal neutron detector: the power of a much larger, much costlier detector that can fit in the palm of your hand (equivalent to 100mm x 13mm Ø 3He at 4 atmospheres).